Thread: Melancholic anime dude drinkin whisky? 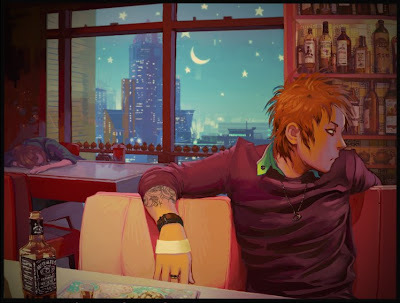 Kind of a random question: anyone know of an artwork done by a concept artist where it shows this anime looking dude looking all sad and there's a glass or a bottle of whiskey or something like that in front of him (or maybe he's holding it). Ring any bell? He might be wearing a marroon colored sweater or something. Anyone know what I'm talking about? I do like the picture though. I'm guessing its supposed to be Gaara? Don't think so, Gaara's got that whole "I'm better than you" intimidating feel thing going on and a whole lot of eyeshadow. This guy doesn't. I dunno, this guys got a fair amount of black outline in the eyes; plus the moon outside would go along with his supposed insomnia (Or at least this is how I understand it, I don't watch the show or read the manga a whole lot). Drown your sorrows with a fine bottle of Jack Daniels #7. Oh wow, that's the one, thanks!!! Dang, Farvus! I want you on my team for trivia boardgames. Could be. Though even though it's got anime stylization going on, I could see some more room for details on the face. It does feel a bit too flat or unfinished in comparison. Cool pic, nice lighting ellements.